Buddha Teas Matcha Green Tea is a 100% organic herbal tea. This green tea variety is made from tea leaves that have been powdered, which gives it a strong, appealing flavor when brewed. Matcha tea is a favorite of tea connoisseurs, and has been enjoyed for more than a thousand years. Unimposing yet statement-making, subtle yet rich, this CBD Matcha Green Tea will take you on a silky journey. Sourced from Japan, Matcha’s place of origin, this tea uses ceremonial grade Matcha to bring out its iconic green color and velvety flavor. From the first sip you will settle into the moment with both elevated calm and mood-boosting energy. 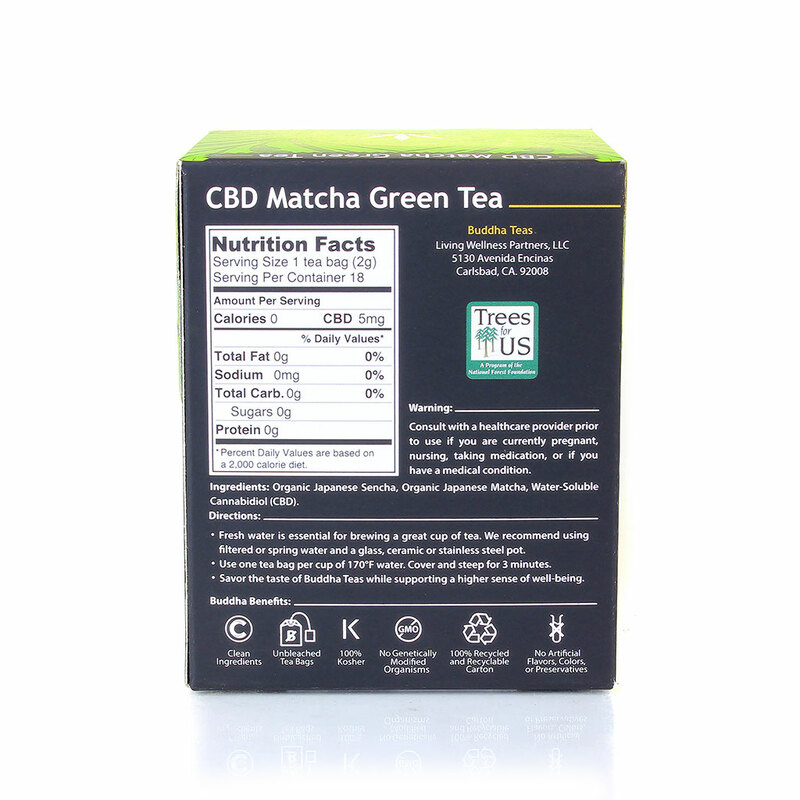 Crafted to include 5mg of water soluble CBD per bag, this smooth CBD tea blend will carry you energetically throughout the day while aiding in blood circulation, mood regulation, cognition, and inflammation. This CBD Matcha Green Tea delicately nurtures your body’s needs, and assists your mind’s desire to relax and be in the moment. When you consider the powerful flavor and energizing effects of a quality cup of matcha tea, it is hardly surprising that it has remained a popular traditional tea since the 11th century. Matcha is derived from green tea leaves, but unlike other green tea, these leaves go through a special preparation process and are ground into a fine powder. This powder provides a more concentrated tea brew, providing a strong, appealing flavor that is both refreshing and invigorating. Matcha powder is the only tea used in the traditional Japanese tea ceremonies, and is served in countries around the world, both as a delicious tea, and as an ingredient in a number of culinary dishes. It's also commonly combined with genmaicha to create a popular blend in Japan. Whether you enjoy its invigorating effects or are drawn to its potent flavor, matcha tea can add a lot to your life. Buddha Teas' matcha tea is prepared exclusively using organic matcha powder and bleach-free tea bags to provide you with a truly high quality tea experience without the risk of added chemicals. They also use fully recycled materials for their tea boxes to be not only consumer friendly, but environmentally friendly as well. With Buddha Teas' competitive prices, you can enjoy a premium quality cup of matcha without breaking your budget.